Mr. Pirate & I were recently at my brother and sister-in-law's house. Mr. Pirate noticed that the placemats on the table were looking a bit peaked. She's always a difficult person to get gifts for since she (like myself) doesn't really NEED anything and if she wants some little thing, she's capable of getting it for herself. But as I sat at the table looking at the placemats, I had a brainstorm ... NEW PLACEMATS! When Mr. Pirate & I returned home, I immediately set to making a set of 4 placemats for her. I had carefully looked at her color scheme (blue) and pulled 12 blue fat quarters to make the placemats from an Angie Padilla pattern. When she opened the box with the placemats, she remembered the amusing incident that occured regarding the placemats and was further *amazed* when she realized that I had made them in the week between we returned home and Christmas. (I didn't enlighten her that placemats are darn-near an Instant Gratification item and take no time at all to make. :-) ). That picture is just a teaser! 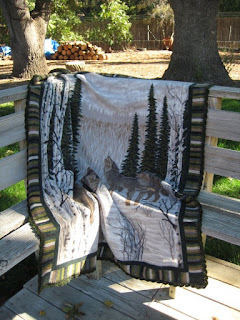 For all the gory details, links and more pictures, please visit my web page for the Diane's placemats quilt. It feels wonderful to have another top made into a quilt. The blue and yellow triangle blocks are from the messload of blocks that I created whilst using a specialty ruler that (for once) is Very Useful. 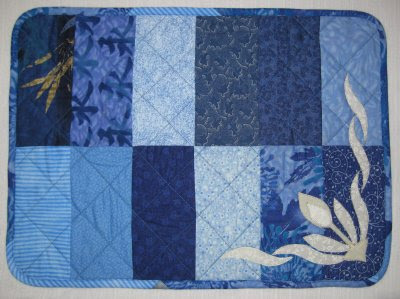 :-) They are the same blocks that I used in another quilt, Equilateral Triangles, quilted in June 2010. 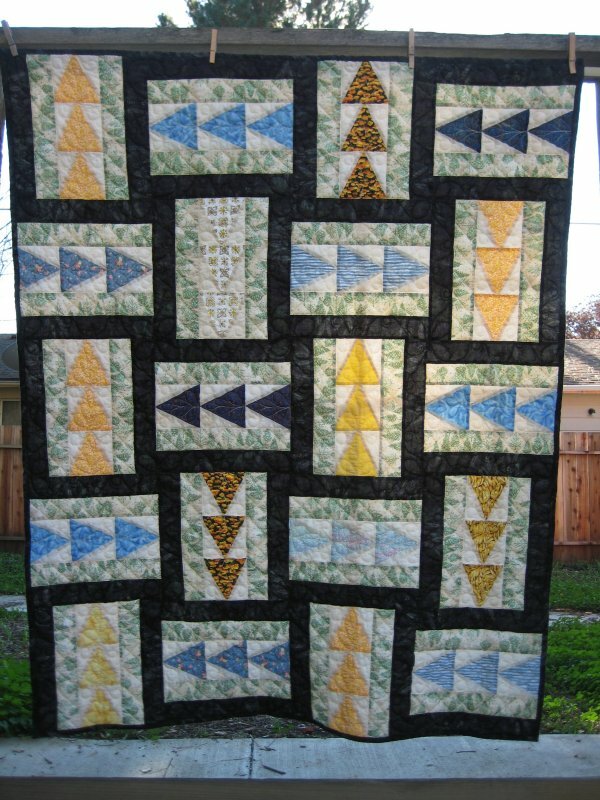 I used Carla Barrett's "Flying Geese Quilting Design" in the triangles, diagonal cross-hatching in the pale green fabric strips and another of Carla Barrett's designs, "Curly Swirly' for the dark green strips. This picture is just a teaser! For all the gory details, links and more pictures, please visit my web page for the Woven Ribbon Trees . I am exceedingly happy to be able to show you guys my recently finished project, "String of Pots". 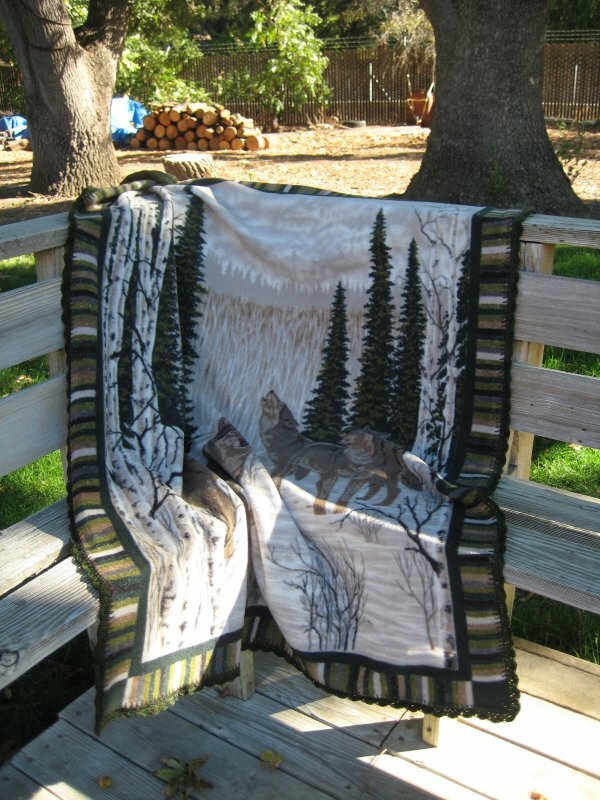 This was a pattern and fabrics I bought in Sedona last year, when Mr. Pirate & I did a road trip there. I don't normally do a lot of wall-hangings these days, as I have plumb run out of wall space (and I don't want to rotate my stock because *I like what I have hanging there! *) but this pattern was very attractive and I thought I'd actually have a fighting chance of getting it finished "soon-ish". I pieced the top shortly after returning home but there it sat, waiting patiently. It wasn't until now, over a year later, that I finally quilted it. Also unusual for me, I did a very dense background fill. This was a calculated move so that the appliqued pots would have a tendency to "puff" out. I could have done a faux trapunto effect for more puffiness, but I didn't. The pots were done with needleturn applique and have hand-embroidered hanging strings and accents. I'm rather pleased with the final effect. Those pictures are just teasers! 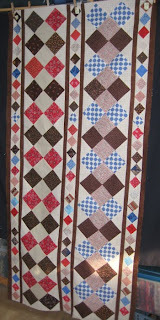 For all the gory details, links and lots more pictures, please visit my web page for the String of Pots quilt. My last Christmas project for your consideration is a throw pillow. I saw this pillow in a Crate-n-Barrel catalogue and shortly thereafter, I was able to see the actual pillow in the store. The entire pillow was made from felt. Whether it was wool felt or polyester, I don't know. I made my version from polyester as wool felt is horrendously expensive. The idea is pretty simple and very effective. The tree is made up of circles. Each circle is tacked in the center to the base fabric. I'm not sure how packed or loose the Crate-n-Barrel pillow was made but I packed my circles pretty doggone tightly. For all the gory detail and another picture, please visit my web page for the Christmas throw pillow. In 2004, our oldest daughter was in college. She was lamenting the fact that she didn't have a Christmas tree in her apartment. She hadn't purchased one and really didn't want to spend the money on one ... but she still missed having one. So, we put our heads together and collaborated to find a solution. We created a wonderful wall-hanging. She drew the graphic (because I can barely draw a straight line with a ruler) and I did the sewing and quilting. This picture is the only one I have before she whisked it off, back to college. I'll have to bug her about getting another picture for display. That picture is just a teaser! For all the gory details and more pictures, please visit my web page for the Practical Christmas tree quilt. Looking for .... a quilt pattern. 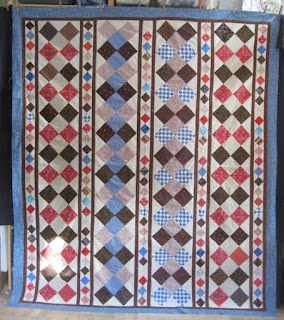 *Somewhere* in my blog reader is a blog where, once upon a time, the quilter posted a picture of an urban, modern, pieced (not appliqued) quilt. 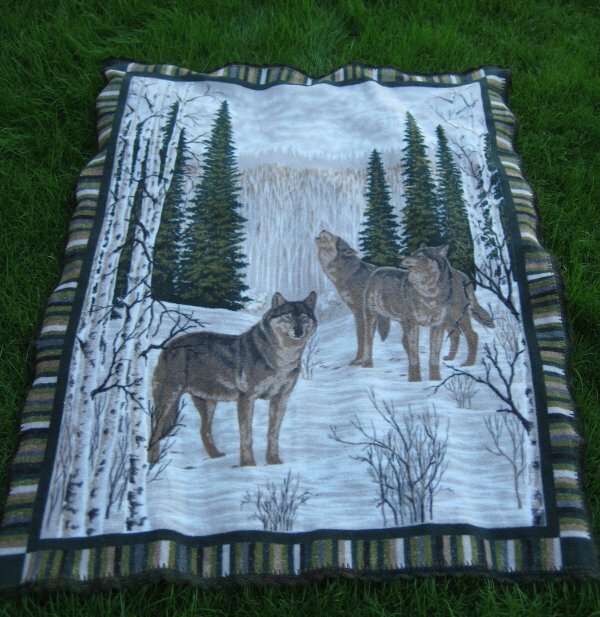 It might have even been labeled as a "masculine" quilt. It's definitely NOT traditional. The background was a medium/dark gray and the stripes were white and orange. Maybe a red one too. I thought FOR SURE I had tagged the blog entry as a keeper. I can't find it. I thought FOR SURE I had kept a copy of the picture. I can't find it. I thought FOR SURE that if I just browsed through my blog subscriptions, I'd certainly find the blogger because the style is so unique. I can't find it. I thought FOR SURE that it would show up Pinterest. I can't find it. I thought FOR SURE that a Google/image search would find it. Nope. But ... I *KNOW* the internet knows. The best I can describe it is a bunch of wide, broad stripes that take a right angle but the right angle is not squared off .. it's *ROUNDED*. 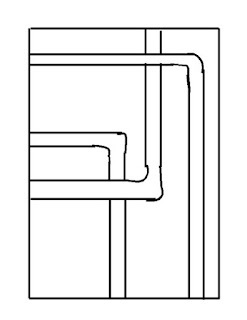 Think of a schematic of pipes. My (badly) drawn image at left is a *representative* of the general look-and-feel of the quilt I am looking for. The quilter has written a book on these types of quilts. Do you think I can remember the name of the book? Of course not. I'm fairly certain that it was done this year (2012) but the way my poor one brain cell is (not) working these days, I'd hate to say that was a firm date. 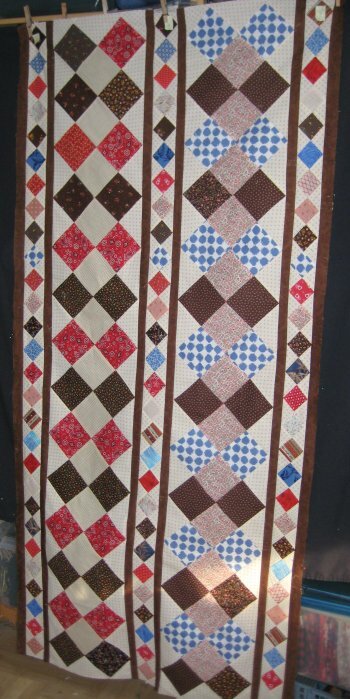 Sooooooo .... does anyone Out There recognize this general quilt design? I'd deeply appreciate your suggestions, responses, guesses as a comment ... so everyone else can see what has already been suggested. Gone with the Wind ... finished! I pieced the top way in 2010 when the specially printed fabric came out. (Subsequent fabric searches reveal that most of the fabric used for this pattern have been discontinued. You may find bits and pieces being sold by private parties, but Quilting Treasures isn't printing it any longer). I didn't particularly care for their pattern layout, so I changed it to suit my own tastes. After the piecing was done, there it lay ... ageing ... sitting contently ... until I just couldn't stand having *all those tops* unquilted (ummm .. 17 at last count). I began to plot the quilting. It wasn't as easy as other quilts. There are some very awkward areas to deal with and I'm just not terribly clever when it comes to quilting designs. I tend to think "inside the box" and have a difficult time stepping outside the lines. But, eventually, it all came together and now, it's done! I feel such a sense of accomplishment! Those pictures are just teasers! 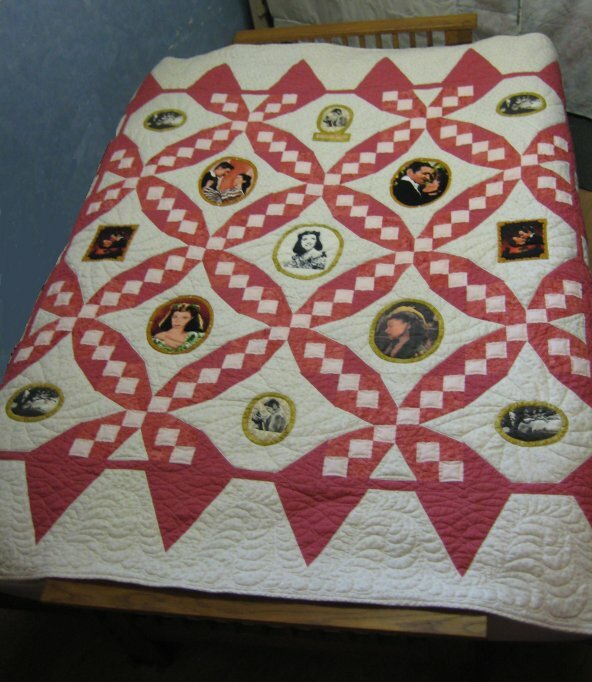 For all the gory details, links and more pictures, please visit my web page for the Gone with the Wind quilt. I don't watch Martha Pullen's show as much as I used to. In fact, I hardly watch it at all these days, as I'm not sewing terminally cute little girl clothing nor am I doing much heirloom embroidery. However, I was surfing through the TV shows being aired recently and came across "Martha's Sewing Room" again. I was finishing up a quilt and decided it would be a good background filler. I was quickly sucked in when one of the segments featured Kari Mecca of "Kari Me Away" designs. 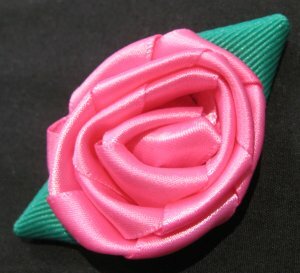 The segment featured how to make ribbon roses ... by sewing machine! 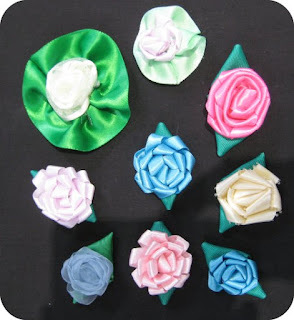 If you've ever tried to make ribbon roses the traditional way (folding, twisting, ad naseum), you'll know that such roses, while beautiful, are time-consuming and can be frustrating. Kari has developed a technique to produce a similar looking rose in a much easier manner. The episode featured is #3403, titled "Whimsical Trims from a Stick" and was originally aired in 2011. Kari's segment is 20 minutes in. From 20 - 26 minutes is instruction on how to make a single loop flower; from 29 - 32 minutes is a demo on how to make the double loop trim and flower. It is very, very easy! Do a Google search on "whimsical trims from a stick" and you'll find lots of hits. I couldn't find a site that would allow you to watch the episode for free. You can, however, buy the episode. Kari has also developed a tool she calls "Whimsy sticks" to help you make the flowers and trim. But I don't have those specific sticks. By watching her demo and seeing how it works, I determined that I could find some make-shift supplies and I did. Her Whimsy sticks are acrylic bars, 1/2", 3/4", 1", 1-1/4" wide and 17" long. Well, I had some Celtic bias bars that would substitute. I don't have the wider widths, but I do have a bar 1/2" wide. I also had a clear ruler that was 2" wide. I could, at the very least, experiment! What I didn't have was the exact instructions of what width ribbon, how long to cut the ribbon and which width bar works with what width ribbon. I imagine that information is included in the Whimsy stick packaging. After all, why should she give away *all* the information? From my ribbon stash, I picked out some 3/8" ribbon and used my 1/2" bar. 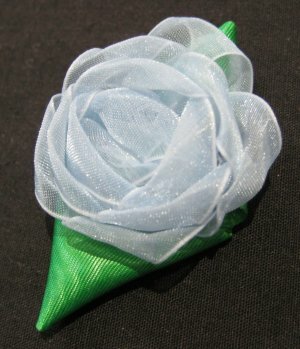 Following the Martha's Sewing Room demo, I made my own ribbon roses! Dang, but they turned out so cute! You wrap the ribbon around the stick (tip from Kari: just hold the ribbon in one hand, secure one end of the ribbon at the top of the bar then turn THE BAR to wrap the ribbon around the bar. That is much easier than physically wrapping *the ribbon*). Then you secure the wraps with a strip of low-tack tape down the center of the wraps, on both sides of the stick. She uses 1/4" Tiger Tape but I didn't have any of that. What I did have was 1" low-tack blue painter's tape. I simply cut 1/4" wide strips. 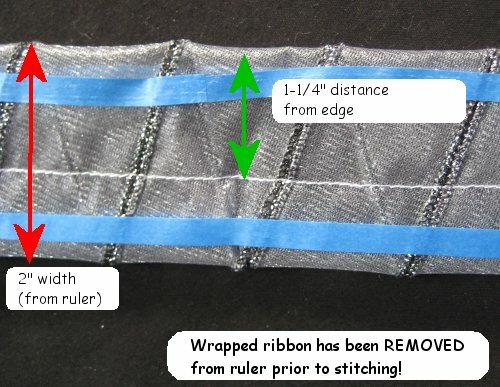 Remove the tape at the top of the ribbon and slide the wrapped ribbon off the stick. The low-tack tape will keep all the loops in place. 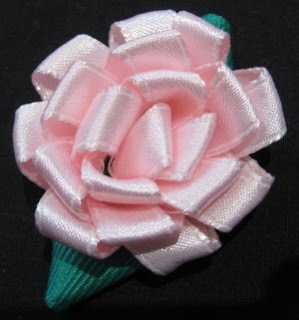 Then you edge-stitch very close to the fold of the ribbon. Look closely at the picture on the left; at the bottom edge, you'll see a line of straight stitching (in white thread). There is no stitching along the top edge. Voila .. a single loop strip! Now, loosely wrap the strip around itself, while holding the base in your fingers. Secure the base with some hand-stitches. I backed my flowers with some leaves made with grosgrain ribbon, but you could just as easily put it on a pin-back or a button form or a circle of felt. 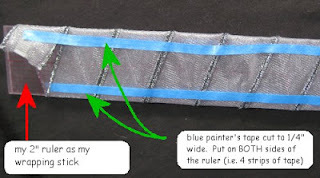 Instead of putting just one strip of low-tack tape down the center, you put *two* strips down the edges .. don't forget to tape each side of the stick! 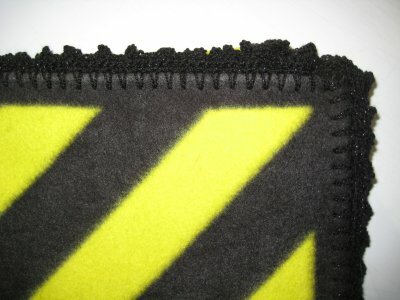 Then, you stitch a line of straight stitches down the middle .. but slightly offset. My ruler was 2" wide, so I stitched at 1-1/4" away from one side. Remove the low-tack tape from one side of the ribbon and *fold* the ribbon on the line of stitching. 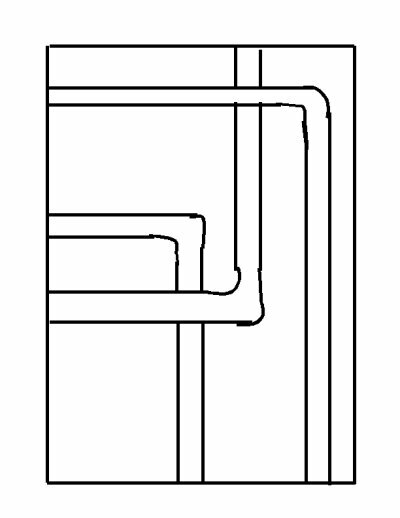 You will see two rows of loops, staggered. Edge-stitch close to the fold, as with the single-loop flowers. Now, make the flowers as before. 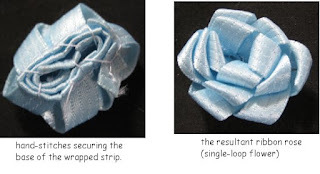 Since these flowers are bigger, Kari made a simple knot with a short length of ribbon as the center of the flower and wrapped the double-loop strip around it. 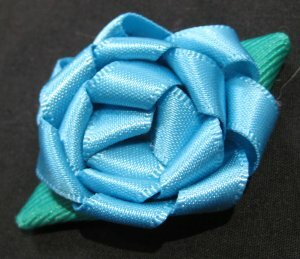 Because I didn't have the specific information on exact ribbon width and stick width, my double-loop flower didn't turn out as loose as Kari's example. My result was a more tightly wrapped flower. I think it still looks nice but it's not the same as Kari's. 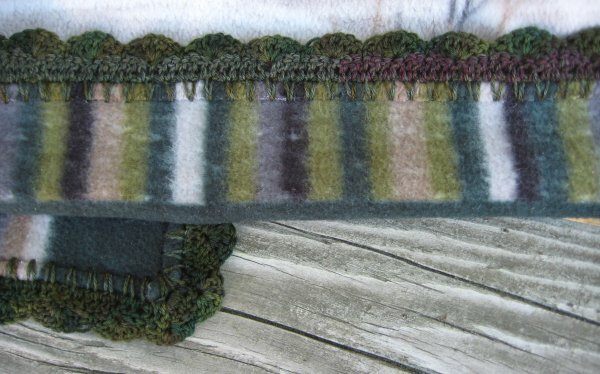 You can also use the loop strips as trim. Here I put a piping trim against the double-loop strip. The blue fabric stands for the garment or sewn item. I didn't have anything in mind when I made this trim, but wanted to "finish it off" to remind myself. These flowers are just terminally cute! Way back in 2001, I got a wild hair in my bonnet and thought it would be a terrific idea to have a wall-hanging for Christmas that had the autographs of all my family members, both my side and Mr. Pirate's side. I found a fantastic pattern (still available, too!) and went to work. I even managed to get *all* of the family members' signatures, which was not that easy since we don't regularly get together with Mr. Pirate's side of the family. I finished the wall-hanging and found a place to display it for the holidays. It was all good ... for a while. Then, as families often do, the family expanded. Members became married. Babies were born. And the way the Christmas tree is designed, it is impossible to add more ornaments to it. That picture is just a teaser! For all the gory details, links and more pictures, please visit my web page for the signature Christmas tree wall-hanging. 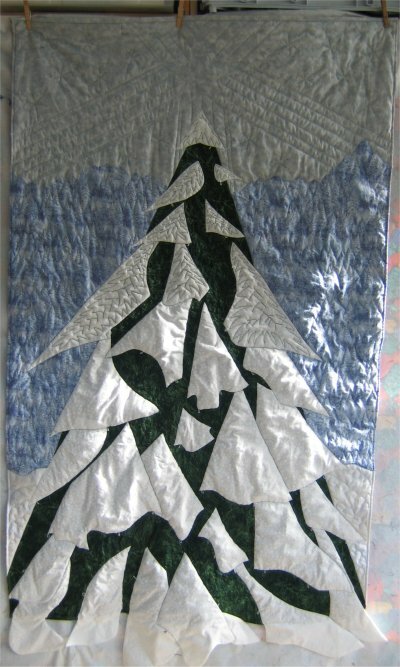 Here's another quilted Christmas project I did some time ago ... in 2001, in fact. The synopsis: a friend of mine had recently had her living room painted. She wanted a dramatic tree skirt for her Christmas tree. I showed her the version in Brenda Henning's "Christmas Traditions in Stained Glass" (the same book I used for the stained glass Christmas stockings) and she just loved how it looked. You can find Brenda Henning's book on her website. 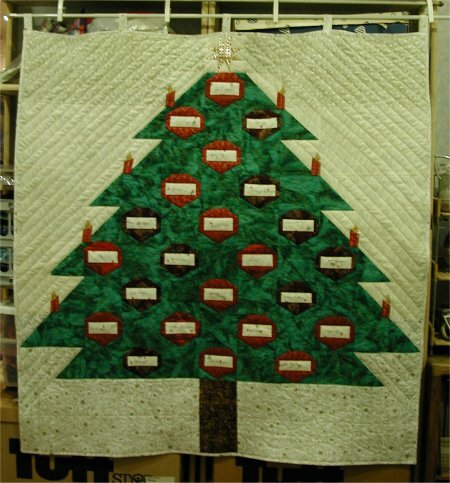 For all the gory details, please visit my web page for the stained glass Christmas tree skirt. As part of my web page relocation project, I have revisited all of my pages. It was a very nice trip down memory lane for me. 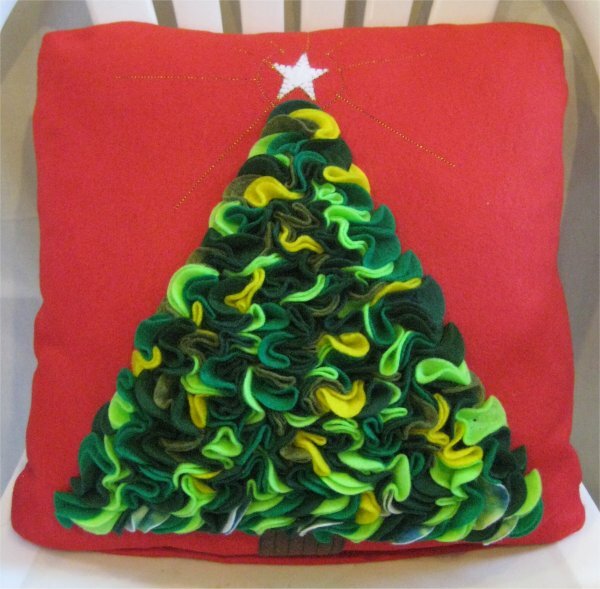 Over the next couple of days, I'm going to share with you some of the Christmas-related quilted items I've made in the past. Here, on the blog, I'll give a brief teaser but will also give you the link to the web page where you can see ALL the pictures and read ALL the verbage. :-) I also have links where I can ... and if those links are still active. 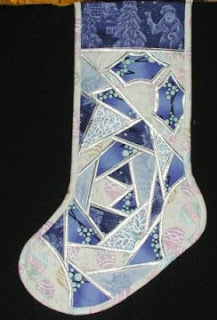 So, without further ado ... today's item is "Stained Glass Christmas Stockings". 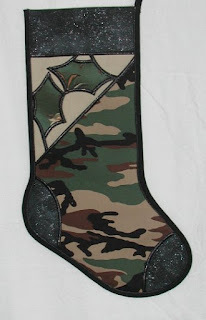 I have 6 Christmas stockings that I hang on the mantelpiece: 5 for our family members and 1 for my "new-ish" son-in-law. (They've been married one year already, so I don't think he qualifies strictly as a "new" SIL. :-) ). Those pictures are just teasers! 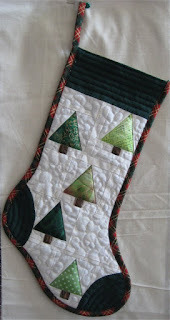 For all the gory details, links and more pictures, please visit my web page for the stained glass Christmas stockings. Ta Da! The Big Announcement! Either one .. makes no difference. They both go to the same website. If you are familiar with the way my pages looked at the previous sites, you'll feel reassured because they are the *same pages*, just relocated to one place. All of my tutorials are still available (for a while) at the Freeservers site. This is because there are a LOT of other websites that have linked to the Freeservers place. I don't want to turn away people who are finding my tutorials from those other websites. I'm in the process of contacting as many as I can to request that they update their links to my new site. 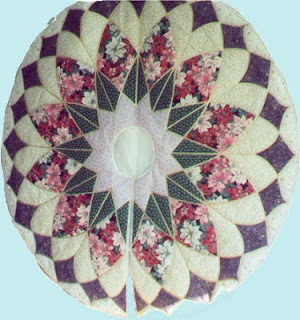 On the new site at PirateRodgers.com, you will find ALL of my tutorials available on the quilting page They are the same web page tutorials as they have always been. The PDFs to download are there also. As I've gone through *each and every web page*, I've updated the info on some of them, as I saw prudent. I was astonished to discover that I have 225 quilting pages, with projects dating from 1978 to current day. I've been working on my current Forever Project, which I am calling Vertical Diamonds. As of right now, at 72" x 84", it's officially longer than my display space. Now that I can see the entire thing hanging, I also see some layout issues but they are going to stay exactly as they are. It's one thing to rip out machine stitching but everything here is *hand stitched* I am absolutely, positively NOT going to remove that stitching to fix any perceived problems. This quilt isn't finished being pieced yet. There is another round of small diamonds, a narrow brown border, a slightly wider blue border and a final narrow brown border. If all goes according to my calculations (HA! ), it should finish around 86" x 113". I'm in the middle of some non-quilting, but necessary, activity. 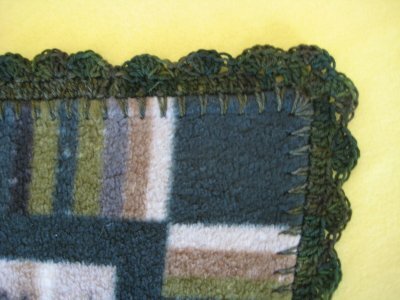 When I first started making web pages as a virtual scrapbook/journal/diary for the stuff I quilted/sewed/embroidered, I got an account at Freeservers.com It worked very nicely for a number of years. Then I reached the point where I needed to get a paid account to obtain more webspace and it just irked me to do so. I know businesses need to charge to make their profit but it just bugged me to need to pay to have the space to show off my pages. I sure wasn't making any money with my stuff, so it was a net monetary drain for me. About that time, I remembered/rediscovered that the ISP where my email is, offered free webspace with the email account! Oh hallelujah! So, I started filling up THAT space with the newer web pages. It was starting to get tricky with the web page construction ... knowing where a specific page was and how to reference it properly. I was trying to keep with relative referencing, instead of absolute, but sometimes that just wasn't possible. Mr. Pirate became more involved with his (extended) family's business and needed webspace for that. All of a sudden, the webspace at the ISP was running short. Ooops. So, this year, we bit the bullet; we registered for a domain and got a hosted webspace at Dreamhost. I began the process ... the TEDIOUS process ... of reviewing Every Single Webpage of mine to update it, not only with verbage corrections and additions but also some technical stuff. My oh-so-clever geeky daughter wrote some server-side includes (SSI) for me so that common elements of HTML code could be put into a library and referenced that way. Much, *much* easier for me, maintenance-wise. All I can say is that it's a Very Good Thing that I used to be a programmer and am used to TEDIOUS, BORING coding and verifying because going through 125+ pages really *is* boring and tedious. Mostly tedious. Programming is one of those activities that you just can't multi-task; you gotta keep focused on the flow of the code otherwise Things Don't Work Right. Once that was done, I started FTP-ing all the files over to the Dreamhost site. Fortunately, that process was a snap. I'm now down to the last bit of checking things out: I need to make sure that the "final" version of the web page is what I want it to be AND to ensure that all the links work properly. OY VEY .. the LINKS! They may be the death of me. But the KILLER problems were my own internal links. Oh. My. Gosh. On my quilting web pages, I have 'back' and 'next' links at the bottom of the page. Just shoot me now ... as I was *INCONSISTENT* with how I named the directories and how I referenced them. Geez, Louise! Where did all the good programmer training go to???? And then ... just to mess with me further ... my old sites were case insensitive, so I was rather sloppy about what words I capitalized and which ones I didn't. Now that I'm at Dreamhost ... guess what? Oh yeah .. they are case sensitive. Just shoot me now (again). So a file/picture named "Quilt front.jpg" is different from "Quilt Front.jpg" from "quilt Front.jpg" from "quilt front.jpg" from "Quilt front.JPG", etc, etc, ad naseum. AAAAARRRRGGGGGGHHHHHH! So, that's how I'm spending my time right now .. going through All Those Links for accuracy. If I had realized the case "problem" when I was originally going through the pages, I would have corrected them at that point ... which would have meant that I would have needed to go correct/update each page only *once*. But no .. I didn't think of the case problem. Now, I'm reaping the results of my sloppiness by needing to correct most of the pages AGAIN. The lesson I learned? From now on, ALL file names will ALWAYS be in lower case. Eventually, eventually, most of my pages (adventures, quilting, sewing, embroidery, whatever) will be on the Dreamhost site and the Freeserver and ISP pages will go away. Hopefully, this will be "transparent to the user" (fingers crossed) so that the readers won't even realize the pages are on a new site. I'll be putting a redirect on the various home pages at Freeservers so people who directly link to those pages will know where the pages have gone. The only pages that I'll leave on the Freeservers site are my original tutorials. There are direct links to them *all over the internet* and rather than ask everyone to please change their links, I'll just leave them where they are. That's just simpler for everyone. Now that I've had this little break from the tedium, it's back to the salt mines ... I have more internal links to verify and correct. aaarrrggghhh. The edging is a simple picot. 2. Finished the quilting for Gone with the Wind. Hallelujah! That one was completed just in time for a customer quilt to arrive. No pictures of the finished quilting yet. 3. Started & finished (woo hoo!) the aforementioned customer quilt. The top is a delightful design of 4 columns of zig-zags in Christmas red. Peeking out behind the red zig-zags are green triangles. The result rather looks like rick-rack placed on top of each other. Surrounding each of these columns is a "gold" frame. All 4 columns are placed on top of a background of a wonderful poinsettia print. The red zig-zags got Carla Barrett's Curly-Swirly treatment and the green triangles got continuous curves. No pictures, as the client hasn't even received the finished quilt yet. 4. Started preliminary design work on a commissioned quilt for one of Mr. Pirate's extended family members. It's to be a queen-sized quilt to coordinate/match a hot-air balloon wall-hanging I had made for her. This could be dicey, as all of YOU know how expensive just the supplies can be. 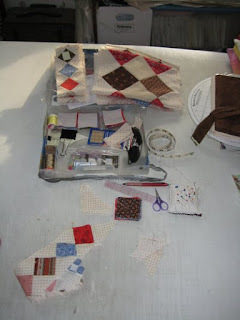 Once you add in the piecing labor and the quilting costs, all of a sudden you have a VERY expensive quilt. You know that and I know that. 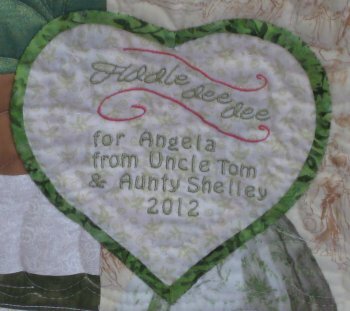 When we gift a quilt, we don't even consider all of those expenses because we are doing something that WE want to do for a person we love/like/admire. But *this* quilt was requested. I emailed 5 different, suggested layouts. One was liked, so I was able to work out some *very* preliminary guesstimates on cost. I kinda/sorta figured out how much fabric it would take (I'm not using a retail pattern). I've figured out the amount for the backing, batting and binding. I've figured out a range for the quilting costs (low to high). I've even been able to grossly estimate what the piecing time might be. So, the next time we email each other, I'll present this cost estimate. THEN I'll see how much she really wants this quilt. 5. I've continued working on my hand-pieced Forever Project. This is a series of columns made of squares on point. It's coming together rather nicely and I'm pleased with it. I may have found a quilting associate who might be willing to trade labor ... her to hand-quilt it in exchange for me machine piecing a top for her. She LOVES to hand-quilt but really doesn't like the piecing part. I know that I'm just NOT going to EVER hand-quilt a bed sized quilt but piecing a top is The Thing That I Do. :-) Definitely a win/win situation. I have all the columns sewn for the center area. I'm now sewing the brown sashing onto those columns, then sewing THOSE units together. Here's my supplies .... they are contained in a project box so I can always just "grab and go'. In the past, I've confined my work on a Forever Project to specifically when I was not at home. I could always be assured that I'd have something to work on. But as my previous Forever Projects became completed, I began to come up with other ideas for MORE Forever Projects. I could load one of those other tops on Lizzie, but I know as soon as I do, Mr. Pirate's relative will get back to me with the information I need to get started. I don't want to be rushed on a quilting job, even if it's for me, so I'll just defer loading *anything* on Lizzie right now. I like fleece blankets. Fleece is warm, it's lightweight, it's durable and launders easily. It's also inexpensive to buy. You can always use fleece yardage as it comes off the bolt, but it looks nicer if the edges are finished. In the past, I bound the edges with double-fold bias binding, just like I would do a quilt ... because I am a quilter and that's how we finish our quilts. But that resulted in a rather bulky and rigid edge. Who woulda thunk it? Somewhere along the way, I rediscovered crocheted edgings. I'm not quite sure where, but now I'm aware of them. Crocheted edgings are soft, flexible and look soooooooooooooooooooooo pretty! :-) While they aren't as fast to apply as a double-fold bias binding, I think they are more appropriate to the soft, drapeability of the fleece. I "found" a skip stitch rotary cutter (previously blogged about here) and having that tool has just been wonderful. It creates regularly spaced holes/slits so you can crochet your foundation row easily. Recently, I was rummaging through the unused bedroom/storage room of one of the Pirate daughters (she no longer lives at home, being independent and all that ... but we haven't quite gotten around to clearing out the room. It still holds a number of her belongings that we are storing for her. Besides, clearing out the room is so .... "final". It means that she's never living here again; that when she does come to visit, she'd be sleeping in a "guest" room instead of her former bedroom. That's just upsetting to me, so her room remains as it is. :-) ). In a completely separate incident, our next-door neighbor recently moved away. She gifted me with two LARGE bags of yarn ... some really nice stuff and some regular, ol' acrylic stuff. My middle Dear Daughter who knits is a yarn snob and refuses to use acrylic yarn because it "feels nasty and squeaks". :-) I have no such restrictions. So with the re-discovery of the fleece yardage, the gifted yarn, my newly acquired skip stitch rotary cutter and no piecing of quilt tops, I decided that I would spend my evening time with Mr. Pirate, while watching our TV shows, doing some crochet edgings on the fleece yardage. The first one that I've finished is this wolf print. Middle Dear Daughter likes wolves, hence this print. See the multi-colored border around the edge? I *think* those were intended to be cut apart for a fringe. However, I really do NOT like fringe on blankets because they tickle. Ick. In the bag of gifted yard, I found a very nice balled yarn in a variegated green/brown mix. It went very nicely with the colors in the wolf fleece. However, there WAS an 'adventure' along the way. This yarn didn't have a label. I have NO idea of the fiber content. It's a very fine-textured yarn. I knew I should be using a smaller crochet hook, but I didn't have one. I didn't want to BUY one because I wanted to do the edging NOW. So, I used what I had, which was a crochet hook larger than I needed. Not being a crocheter, I have absolutely no way of estimating how much yarn anything will take. The yarn I was using looked like a big amount, so I simply started doing my foundation row then proceeded onto the next row of double crochet. It was somewhere along the double crochet row that I began to suspect that I might run out of yarn before I reached the starting point. Oops. And that turned out to be exactly the case. So, I went over to my local yarn shop (where middle Dear Daughter had worked at one point) to see if they had something compatible in yarn size and color. Oh, happy, happy .. they did! I also bought a crochet hook which was more suitable to the size of the yarn. Oh unhappy, unhappy .... the yarn was $42. Oh. My. Gosh. Holey moley. Cripes. Geez, Louise. This makeshift project that was "free" just became an Expensive Project. :-( But, I bought it anyway because it so perfectly matched the yarn I was using. In retrospect, I suppose I *could* have ripped out the ENTIRE row of double crochet and re-stitched it with a row of single crochet (and thereby not requiring more yarn) but I was *almost done* with the double crochet. I didn't want to rip out *everything*! And then, of course, now that I had more than enough yarn, I could finish the edging with a shell stitch. Which I did. I used the larger crochet hook to finish the row of double crochet but switched to the smaller, more appropriate hook to do the shell stitch. In any case, I am very happy with the results of my crochetting. I think it looks very pretty.